We love hearing from teachers who integrated the arts into their STEM instruction. 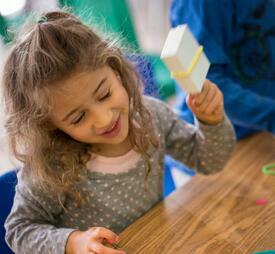 STEAM (Science, Technology, Engineering, Arts, and Math) activities can enrich student learning by providing learners with different ways to engage with STEM concepts. To support educators who want to incorporate the arts into their STEM instruction, we’ve highlighted a few of our favorite examples below. When we saw a recent NPR article about how using gestures can help kids learn, we immediately thought of Amy Williams. Amy; a dance teacher from Columbus, Ohio; shared her innovative STEAM extension to Marvelous Machines: Making Work Easier with us last July on the EiE blog. 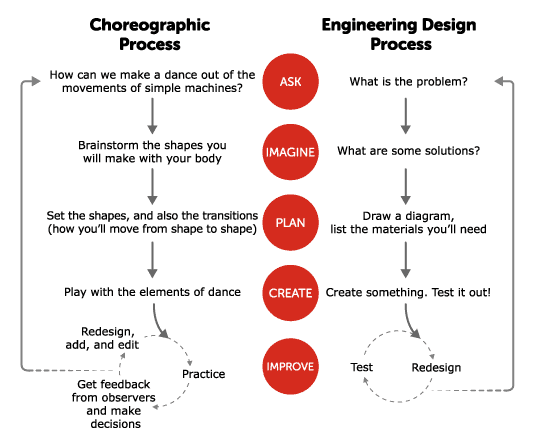 She noticed the similarities between the Engineering Design Process and the process used by choreographers to create a dance and used this discovery to add movement to her students’ engineering exploration. After learning about the Engineering Design Process and simple machines in science class, her second graders worked to choreograph dances that were inspired by the movement of a simple machine. Amy’s STEAM extension to our unit is a great example of an innovative way to integrate dance with STEM exercises. Amy notes that even schools without a dance teacher on staff can implement her idea, recommending that educators “do it [themselves], ask the physical education teacher to join in, or reach out to community artists.” She provides additional ideas like creating a dance to depict lava as it bubbles up, explodes, travels down the volcano and hardens, or choreographing the life cycle of a butterfly from egg to larvae to adult. During an early focus group for our preschool engineering curriculum, a teacher suggested setting the steps of our age-appropriate, three-step engineering design process to music with accompanying dance moves. We loved this idea because we knew it could help educators reinforce the EDP terms with their youngest learners. Jess Jarvis, an early childhood educator, helped us test out activities for Wee Engineer last year, including the EDP song! Watch the video below for a glimpse of her preschoolers performing the song with its accompanying dance moves. What a fun and musical way to help the EDP “stick” with even the youngest engineers! For more information on how EiE can help you introduce STEAM activities into your classroom, check out our STEAM Activity ideas board on the EiE Pinterest. If you’re in California, look out for EiE professional development provider Katy Hutchinson’s session “Designing Plant Packages with the Consumer in Mind” at the California STEAM Symposium this December.